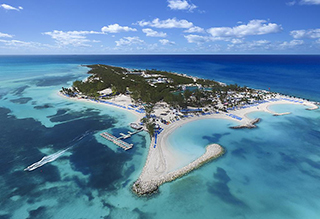 The cruise industry is gathering in Miami Beach this week for the annual Seatrade conference, and one current trend cruise execs expect will lead to increased customer satisfaction is the expanding number of private islands in the Bahamas. On March 16, Mariner of the Seas became Royal Caribbean International's first ship to arrive in CocoCay, where guests got to use the new swimming pool and new pier (no tendering). Several key attractions will open in May as the Perfect Day/CocoCay experience fleshes out. Everything is running on schedule. CocoCay (once called Little Stirrup Cay) is less than a mile from Great Stirrup Cay, which is Norwegian Cruise Line's private island in the Bahamas, which itself recently underwent substantial improvements. From one island, you can see not only the other island but even ships at the other island. And from Great Stirrup Cay, NCL passengers can see the largest water slide in North America on Royal's island. From CocoCay, RCL vacationers can see NCL customers parasailing above Great Stirrup Cay. Numerous other projects are in the works, including MSC's Ocean Cay, now set for a November soft opening. And several sources at SeaTrade told Cruise Week to expect an announcement shortly from another leading line regarding their expansion plans in this area. The general feeling of those we've talked to about the expansion of private island space is that it will lead to healthy competition that's good for business overall. Predictions are passengers won't think, "grass is greener," but instead, "let's try that, too."